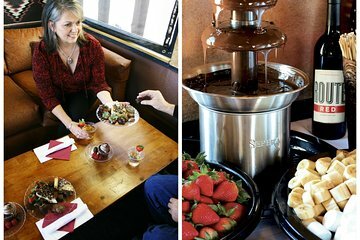 Treat your loved one to a sweet, Sedona-style Valentine's Day with a ride aboard the Verde Canyon Railroad complete with a chocolate tasting assortment. Cozy up in a vintage first-class coach outfitted with a plush love seat or bistro chairs to watch the passing scenery of historic mines, cliff dwellings, and desert wildlife through large picture windows. During the ride, indulge in a selection of chocolatey desserts including a chocolate fountain with marshmallows and other goodies to dip in the cocoa cascade.